Scarlett is 17 months old. I don't actually know her current weight and height because we don't see the doctor every week! She's probably still approaching 21 pounds. She is solidly in 12-18 month clothes, but is beginning to outgrow pants, thanks to her non-walker thighs. She still has tiny feet, only in size 3 shoes. She has become an expert at removing hats, headbands, socks, and of course, her right hearing aid, which seems to disappear with ninja-like stealth. She is babbling constantly, and we're hearing a lot more "mama" and "dada" (along with baba, gaga, wawa, and a bunch of others), and starting to see more word recognition in her little face. She is SO expressive - giant smiles (as long as no cameras are present! ), blowing raspberries, flapping her arms, kicking, and shaking her head, sometimes all at the same time! We're trying to catch her playing peek-a-boo on video to share. 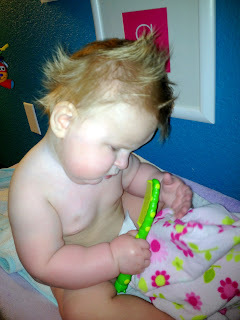 Wild hair after a bath! She working on her 16th tooth - an even 8 on top and bottom - which is good, because she is discovering the joys of chewing! Not just spoons and momma's fingers, either. She likes purple star puffs, Multigrain Cheerios and all kinds of crackers. She is a big fan of dried fruit, particularly mangoes, apricots, and bananas. She still hasn't mastered drinking, but we're hoping that her new interest in swallowing snacks will translate to swallowing liquids soon. She is working hard on holding herself up on hands and knees, and will occasionally reach out for something she wants. Our current physical therapy goal is promoting more rotation at her waist and hips so she can begin transitioning from sitting to laying, laying to sitting, sitting to crawling, and eventually to standing. It's hard work, but she such a trooper about this stuff. The most exciting thing about the last few weeks has been starting swimming lessons! Scarlett LOVES the water, and we thought that swimming would be a good way to incorporate some more therapeutic "exercise" into her routine in a fun way. We take a mommy- (or daddy) and-me class at an indoor pool complex down the street from our house, so the water is warm and we are comfortable in swimsuits despite the storms outside. She is already learning to hold the side of the pool, roll in the water, kick her legs, splash and - her favorite - to jump in (from sitting on the side). I remember taking this picture, then posting it on the blog from the hospital while she was getting a major blood transfusion later that afternoon, getting ready to begin her second round of chemo. She was so tiny, so sick, but so happy. Now she's 15 months out from diagnosis, tumor-free and still full of smiles! I have been following Scarlett's story since you started the blog, and it is just so heartwarming to see how far she has come! That swimming picture just brings a smile to my face, so beautiful and happy! I LOVE the swimming lessons! and man does her face light up in the water :) I also love her new swallowing prowess and have my fingers crossed for liquids soon. Thanks for sharing all this again I love seeing all the new and wonderful updates! Love the new pictures!!! Been following from the very beginning and I remember the day you posted that pic last year. So, so happy to see Scarlett doing so well! Happy happy happy 17 months! I am 'enjoying' watching Scarlett grow and develop and do the things I wish my Eva would be doing. Your 1 year ago picture is gorgeous. ! year ago we still had our Eva. Thanks for posting and sharing your Scarlett with the rest of us. She is getting so big. She looks like a happy beautiful little girl!